Lovechock Goji Orange – love at first bite! 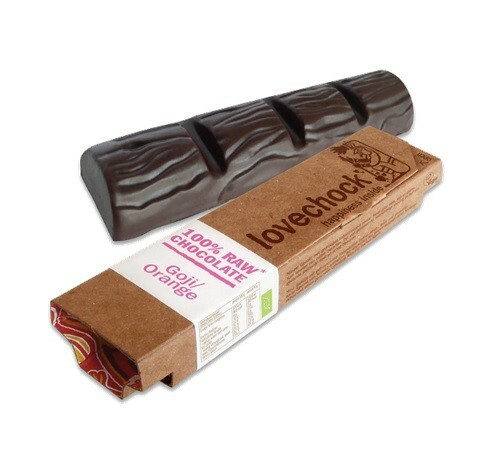 A tempting, hand made raw chocolate bar, lovingly prepared using entirely natural ingredients, including raw cacao, goji berries and orange. A delicious snack between meals and ideal directly before or immediately after a rigorous workout. Cacao mass, cacao butter, goji berries, buckwheat, dried coconut blossom nectar, lucuma powder, vanilla powder, cinnamon, salt, orange oil, orange blossom. 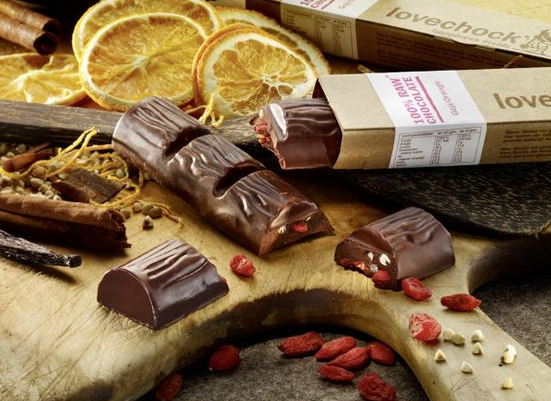 Do not order Lovechock if you are allergic to caffeine, cacao, goji berries, buckwheat, coconut blossom nectar, lucuma powder, vanilla powder, cinnamon, salt, orange oil, orange blossom or any other of the product’s ingredients. May contain traces of nuts. Always read the product information carefully, before deciding to buy Lovechock bars. In extremely rare cases may cause digestive problems including stomach pain, nausea, constipation, hyperactivity or very mild hallucinations.